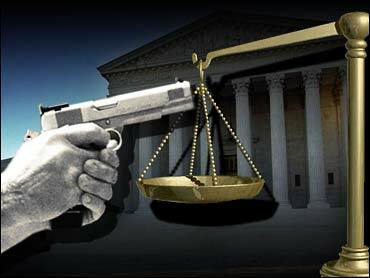 The Supreme Court ruled Tuesday that people convicted of a crime overseas may own a gun in the United States. In a 5-3 decision, the court ruled in favor of Gary Sherwood Small of Pennsylvania. The court reasoned that U.S. law, which prohibits felons who have been convicted in "any court" from owning guns, applies only to domestic crimes. Justice Stephen G. Breyer, writing for the majority, said interpreting the law broadly to apply to foreign convictions would be unfair to defendants because procedural protections are often less in international courts. If Congress intended foreign convictions to apply, they can rewrite the law to specifically say so, he said. "We have no reason to believe that Congress considered the added enforcement advantages flowing from inclusion of foreign crimes, weighing them against, say, the potential unfairness of preventing those with inapt foreign convictions from possessing guns," Breyer wrote. He was joined by Justices John Paul Stevens, Sandra Day O'Connor, David H. Souter and Ruth Bader Ginsburg. The conventional wisdom is that conservatives are the most zealous protectors of gun rights, reports CBS News Correspondent Barry Bagnato. In this case, though, conservative justices Antonin Scalia and Clarence Thomas voted against allowing foreign felons to own guns here, saying that's not want Congress intended. In a dissent, Thomas argued that "any" court literally means any court. "Read naturally, the word 'any' has an expansive meaning, that is, 'one or some indiscriminately of whatever kind,'" Thomas said. He was joined by Scalia and Anthony Kennedy. Small had answered "no" to the felony conviction question on a federal form when he bought a handgun in 1998, a few days after he was paroled from a Japanese prison for violating weapons laws in that country. Small was indicted in 2000 for lying on the form and for illegally owning two pistols and 335 rounds of ammunition. He later entered a conditional guilty plea pending the outcome of this case. The Bush administration had asked the court to apply the statute to foreign convictions. Chief Justice William H. Rehnquist did not participate in deciding the case, which was heard in November when he was undergoing treatment for thyroid cancer. The case is Small v. United States, 03-750.